Over the years Limelight has earned a reputation for representing some of the most recognized artists in the gallery world. 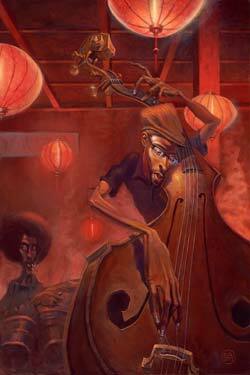 With their great diversity, they all share one impressive distinction, they are the leading artistic names of their own cultural genres. The Rock art of Ronnie Wood, Sports art of Stephen Holland, the distinctive celebrity paintings of Sebastian Kruger are just a few examples. Artists of this ilk are rare to come by, and an opportunity to work with one is rarer still. This is why there is no rooftop high enough to shout today's announcement that Limelight will be representing the leading artist of urban life Justin BUA. BUA grew up on the streets of New York's upper west side, where in the late 70's and early 80's modern urban culture first took rise. 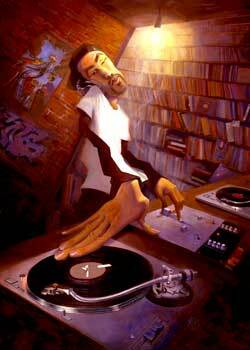 From this petri dish of city life came the first DJs, masters of the microphone, graffiti artists, and breakdancers. During these legendary days of the birth of Hip Hop, BUA was as a member of the first breakdancing crew to perform in major opera houses and venues across the world. Along the way he grew as a visual artist as well, soaking in the culture that surrounded him, from the music in the streets to the colorful cast of characters that made up the neighborhood. Like many artists of this place and time BUA's early canvases were the city walls around him. But with studied appreciation for the classical masters, paper and canvas soon replaced brick and cement. His talents took him first to Fiorello H. LaGuardia High School of Music and Performing Arts and later to America's leading school of visual arts, Pasadena's Art Center College Of Design. Today he teaches classical figure drawing at the University of Southern California. BUA's masterful paintings, infused with both the rhythms of the street and classical training, tell the tales of urban life through his cast of city muses. It is for this reason that he is the biggest living name in poster sales, collected by literally millions of fans, ranging from street kids to art connoisseurs, to celebrities and Presidents. His art and name have become ubiquitous with authentic urban style, as seen through his collaborations with EA Sports video games, special edition shoes, music videos, books, animated TV shows, and the credits go on.